Pucker up—you’re underneath the mistletoe! 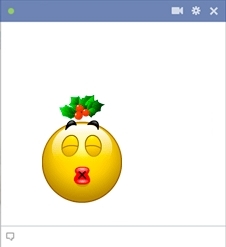 Bring a smile to someone’s face when you send this kissable smiley in your Facebook chat session. We have so much fun designing our unique smileys because we want you to have so much fun browsing our collection and sharing them with your friends on FB!